How quickly can the fence be removed? Most fences can be removed in less than 15 minutes (by an adult), then rolled up and put away. Baby Guard's mesh and poles are designed to require little maintenance. Simply wash the fence with a hose and a mild detergent only when needed. Spray the locks with WD-40 monthly. Inspect your fence frequently for any faults that may occur due to weather and such. Are there openings to get into the pool, or does the fence have to be taken down to use the pool? Baby Guard provides two entryways to the pool area. If the customer wishes, we can provide more access. The entryways are easy to use by adults but cannot be accessed by children. Additionally, Baby Guard offers a patented self-closing, key-lockable gate for added safety and convenience. Baby Guard's manufacturer's warranty covers all materials and installation that may be faulty or defective. Will weather affect the fence? The fence is designed to withstand typical weather conditions. Extreme weather such as hurricanes, tornados, etc are not covered under the warranty. A typical Baby Guard fence installation can take anywhere from 2-4 hours at the most. Who will be installing my fence? Only a certified independent Baby Guard installer is authorized to install a Baby Guard Pool Fence. 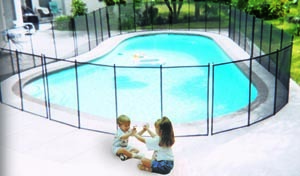 Baby Guard's owners have been in the pool safety business since 1995, and is one of the largest provider of safety pool fences in the United States and internationally. If your question was not answered in this section, please feel free to email or call toll-free at 305-829-7670. Drowning isn't really a problem, is it? Yes. Drowning is the leading cause of unintentional death among children ages one to four in the United States today. A residential pool is 14 times more likely to cause a death than an automobile. More children drown in open water than in swimming pools. No. More than 50 percent of deaths by drowning occur in residential pools. Natural bodies of water comprise 19 percent. Public pools another 19 percent. Isn't it more important to have a locked gate to keep neighbors out? No. Nearly 65 percent of the children were at their own home at the time of the incident. Forty-six percent of the children were last seen safe inside the house just before the drowning and 72 percent had direct access to the pool once they were outside the home. Will swimming lessons protect a child from drowning? No. Swimming lessons do not prepare a child for a drowning or near-drowning situation. Isn't constant supervision enough to prevent drowning? No. Experts recommend "layers" of protection which include a well-maintained fence with a self-closing, self-latching gate and alarm systems, powered safety pool covers, and self-closing, self-latching doors with automatic sliding door closers. Is there any proof that fences or safety barriers work? Can't a child climb over a fence? Yes. In studies conducted in Australia and New Zealand, the findings suggest that adequate, four-sided pool fencing reduced drownings by 80 percent while studies in Arizona demonstrated a 50 percent reduction. Do pool owners without young children need to install protective barriers? Yes. Statistics show that 35 percent of residential drownings are not at the home of the victim.